Phyllis, thank you so much for selecting my blog post last week, "blessed with every spiritual blessing" as one of your "favorites from last week"...I enjoy linking up with Prairie Dust Trail...such good, wholesome information here. Many blessings to you! We've really enjoyed having you Beth. Please come back again! Thank you so much for this link up! 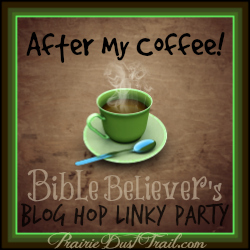 Enjoying linking every week with your #aftermycoffee. Great articles and links. Thank you! I'm enjoying this so much! I'm so blessed!